Just the other day I went to visit my good friend Jake at his office. I always look forward to seeing him and catching up, but there is an added incentive for my visits to his office. He happens to work in the building that houses Chelsea Market. For the uninitiated, Chelsea Market is a collection of shops on the ground floor of an office building on 9th Avenue between 15th and 16th Street. The majority of the businesses in the market are food vendors or food related. Food and drink purveyors like 9th Street Espresso, Jacques Torres Chocolate, Fat Witch Bakery, Amy's Bread and Ronnybrook Dairy have made The Chelsea Market a food destination for New Yorkers and tourists alike. One of the newer businesses in the Market is Dickson's Farmstand Meats. Dickson's is a butcher dedicated to providing high quality meat and meat products from local farms with naturally fed, humanely-raised animals. Their selection of meats is top notch and they feature cuts that can be hard to find. Their staff and butchers are friendly and very knowledgeable. 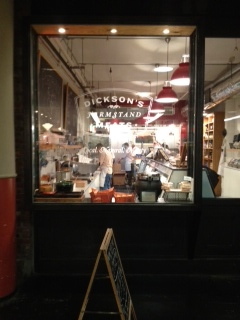 Considering the dearth of good butchers in New York, Dickson's is a welcome addition to Chelsea Market. We have a winner. Two black pepper biscuits are sliced in half, spread with whole grain mustard AND house made honey butter then filled with hot southern ham. I ordered it. A GuS's Dry Cranberry and Lime Soda and Zapp's Cajun Crawtaters Chips rounded out what was a truly perfect lunch. The biscuits were firm and savory, holding everything together. The spicy mustard and sweet honey butter perfectly complimented each other. They all played great supporting rolls to the moist, rich ham piled inside. The warm ham melted the butter, letting it mingle with the juices from the ham. Every bite was perfection. It was one of those rare moments when you were expecting something good and got something even better. True Heaven. The building that houses Chelsea Market was originally owned by the National Biscuit Company (now a little company now known as Nabisco). It was one of the centers of baking in New York City. That history has been brought back to life by the numerous bakeries in Chelsea Market. Dickson's Southern Ham Biscuits are the latest tribute to that history, and a they make damned fine lunch.